Lately I have been thinking about flamethrowers a bit, and I have come to the conclusion that if/when someone gets around to making a nice fairly battle-ready exoskeleton, that to combine the two would make a formidable weapon, if you look at it, they complement each others weaknesses and stregnths quite well. One of the main things keeping exoskeletons from appearing in anything but tethered forms is their large power consumption, and untill someone invents a usable arc reactor small enough to mount on one, the next best thing is gasoline. It is fairly abundant, very power-dense, and we have tech now that turns it into useful power. But there is the argument that having a big tank of gas on your back might not be a super good idea, after all, you DO have a big tank of gas on your back. However, the flamethrower requires a big tank of gas anyway. Another thing: the two big downsides of flamethrowers is 1, you need to get close to battle in order to use it effectively, exposing you to enemy fire. (armoured exoskeleton anyone?) 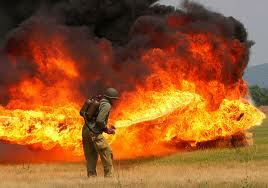 and 2, flamethrowers are HEAVY, and even then, they do not have that much fuel capacity. 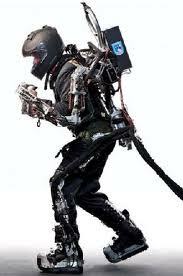 What are the main things about exoskeletons? improving stamina and (here it comes...) Improving weight handling capacity! So you have a weapon with lots of fuel for burning stuff, armour that lets you get close enough to acutally use it, and the drawbacks common to both designs fairly accounted for.